When a friend asked me to prepare a pumpkin salad for a Thanksgiving dinner I felt I’d gotten away lightly. If the request had involved turkey or ham I would’ve been worried. I mean how difficult can a pumpkin salad be? It wasn’t complexity that got the better of me but rather indecisiveness. After browsing through half a dozen cookbooks and Googling ‘pumpkin salad’ I was overwhelmed by choice. I deliberated over feta versus goats cheese, spinach versus basil and pine nuts versus macadamia nuts. That’s not to mention the to use or not to use beetroot decision. Deliberation over here’s the salad and the recipe below – it’s an adaptation of a recipe I found online. I made a huge portion as I was serving over 20 guests, so adjust the quantities below as needed. 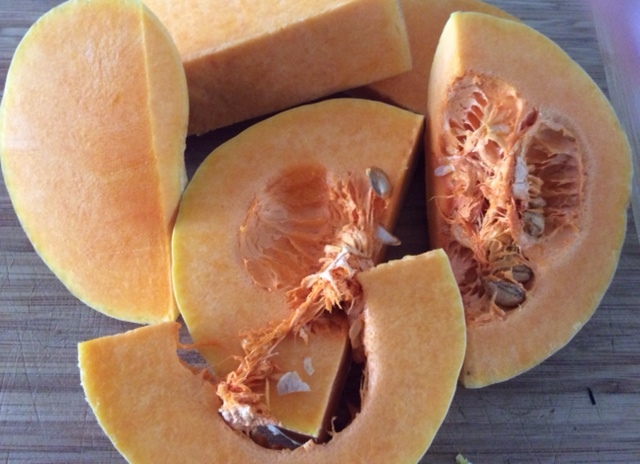 Remove the pumpkin skin and dice the flesh into bitesize pieces. Drizzle over a little oil and season. Cook the pumpkin at 180-200C until it’s soft but not mushy (around 20 minutes). While the pumpkin cooks wash and dry the spinach leaves and finely slice the onion. Mix together the remaining olive oil, lemon juice and balsamic vinegar to make the dressing. Add the spinach and onion to a large bowl. Chop the cherry tomatoes in half and add them to the bowl. 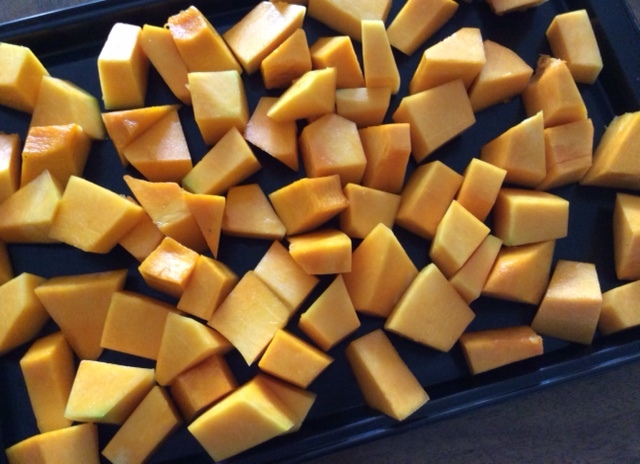 Remove the pumpkin from the oven, allow to cool slightly and then add to the salad. Mix through the dressing and add more seasoning to taste. Chop and sprinkle over the chilli and add the goats cheese in small dollops. Crush the macadamia nuts if you’re using them and sprinkle over the salad. Give everything one final and very gentle mix (perhaps using clean hands). 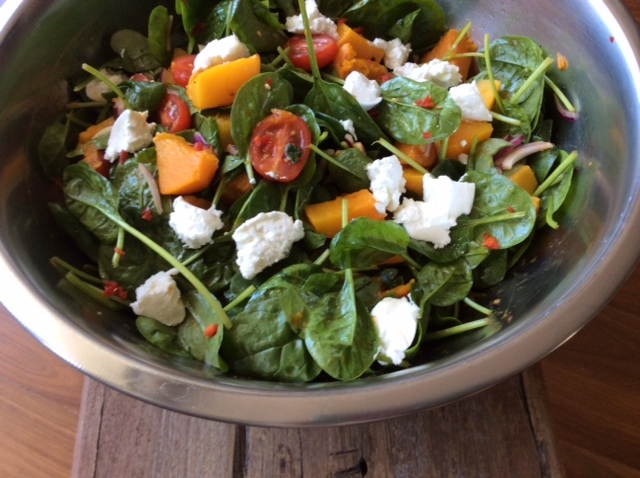 Tags: easy, goats cheese, onion, Pumpkin, recipe, salad, spinach. Bookmark the permalink. Such a lovely looking salad. Pumpkin with goats cheese is always a winning combo! They did and there were some leftovers for me the next day too! You just gave me a wonderful salad to take to a friends for dinner next week. She asked me to bring a salad and I really wanted to bring something seasonal that didn’t involve kale. This looks perfect. Thanks – the bonus is that it’s really quick and easy to make. 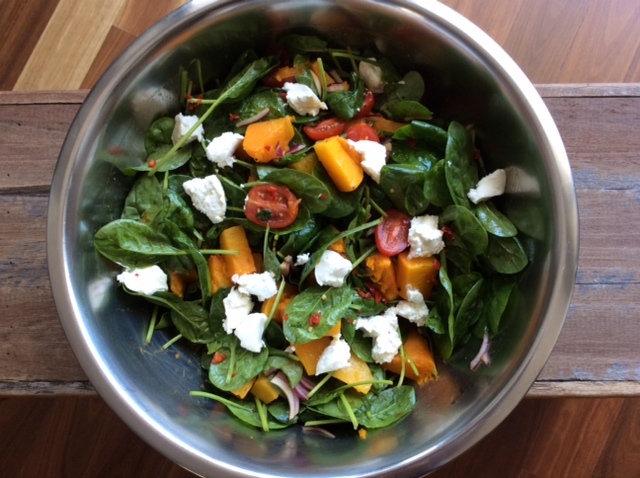 Just don’t let it sit in the fridge for long once prepared or the spinach can wilt and go soggy….. Yes good idea – I didn’t think of that………. Thats the kind of salad I can eat for lunch on a sunny day. It looks colourful and delicious too!! I love goat cheese!!! 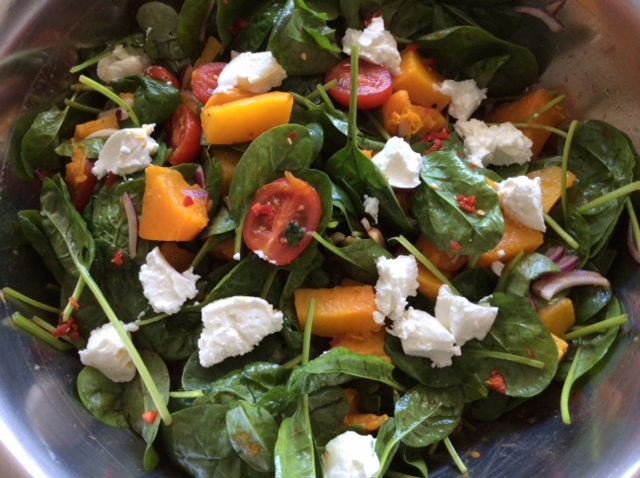 Thanks me too – goats cheese is my favourite, it’s delicious on pizza too with pumpkin and red onion….